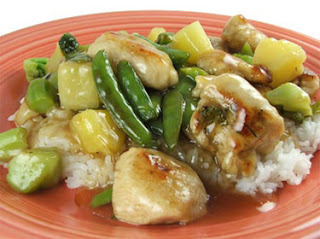 This recipe tastes so much like takeout Sweet-n-Sour Chicken, you will never order it again! Combine vinegar, garlic, soy sauce, ginger and red pepper flakes in medium bowl. Toss chicken with vinegar mixture. Marinate 20 minutes at room temperature. Heat oil in a wok or large skillet over medium-high heat. Drain chicken; reserve marinade. Add chicken to wok and stir fry 3 minutes or until no longer pink. Stir in onions, green pepper and snow peas. Stir fry 3 minutes longer. Stir cornstarch into the reserved marinade. Stir broth, fruit spread and marinade mixture into wok. Cook and stir 1 minute or until sauce boils and thickens. Add pineapple and heat through. Serve over rice.